CFZ-NEW ZEALAND: NZ storm petrel back from brink? 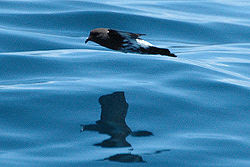 NZ storm petrel back from brink? Here's a story to warm the cockles of a jaded naturalist's heart. The NZ storm petrel, which we shared some news about last year, appears to be doing its darnedest to fight its extinction tag. The bird dropped off the radar in about 1895. It was rediscovered by birdwatchers in 2003, near the Mercury Islands. But no-one knows how or where the birds survived, or how many are left, or where they're breeding - the last point crucial for scientists seeking much-needed conservation funding. "Chris Gaskin, spokesperson for the team of scientists researching the bird, has sent me a photograph of the bird with a stalk tangled in its legs. Gaskin and his team have spent a long time scrutinising that stalk, and they've worked out it's from a houpara plant. "It's most likely the bird picked up the stalk while it was shuffling along the ground at its nesting site. (They never actually land anywhere else). This is huge news in itself: it strongly suggests that the birds are breeding in New Zealand. "Further, the bird in the photo has tatty feathers, which suggests it's been shuffling around on land recently, which suggests it's been breeding recently. "Back to the stalk. The team worked out all the islands that houpara plants grow on. Then they crossed out all the islands that are known to have rats, because if rats were present the birds would likely have been wiped out. "That knocked out about 10 islands but still leaves a few dozen. Great news indeed. Let's hope the NZ storm petrel flies its way out of extinction!